In our newsletter, we try to give you an accurate listing of the produce in your box; however, since the newsletter is published before the harvest, we may sometimes substitute some vegetables for others. The information provided here is also published each week on our website. **Also, if you’re having trouble identifying any unfamiliar produce, please look for “Veggie ID” with additional information on our website under CSA INFO or under RECIPES. GREENS ADVICE for the entire season: Please keep in mind that greens are especially prominent during this early part of the farm season, so basically, “It’s salad time!” If you’re not sure how best to enjoy your green, taste it. Greens can be eaten raw in a salad or lightly steamed or sautéed in order to mellow their flavor. They can also be tossed into a dish (such as soup) for an extra nutritional boost. ARUGULA : an aromatic, bright salad green with a peppery mustard flavor. This will be the peppery green bunched in a bag with Spinach and Yukina Savoy bunches. -How to store: very perishable, so use up quickly; store in plastic bag with a paper towel in refrigerator for up to 5 days. ASPARAGUS: You will receive a bunch of green, purple, or white variety; each contains vitamins A, B, and C, as well as iron. – How to use: serve raw, chopped in salads, or with dips. You can also steam, roast, grill, or serve “cold” with a bit of olive oil, a dash of salt, and lemon juice. – How to store: wrap in damp cloth and plastic bag, then refrigerate. GARLIC SCAPES: This popular and highly delectable flower top of a garlic plant has a slender green stem with a slight bulge at the bottom (resemble chives, except for the bulge and often curled); tender and milder in flavor than mature garlic, but can be substituted for garlic cloves in recipes. **See attached recipes to online newsletter. How to use: mild garlic flavor, so delicious chopped in salads, roasted, and sautéed. How to store: put in refrigerator in plastic bag for up to 2 weeks. – How to store: In general, store herbs upright with cut stems in 1 or 2 inches of water and refrigerate for up to 2 weeks or wrap in slightly dampened cloth and store in refrigerator. Chives—mild, onion-flavored herb with long, slender, hollow leaves; can be added to potato salad, baked potatoes, soups, salads, omelets, dips and spreads, pastas and sauces. ; purple, onion-flavored blossoms add an attractive garnish to soups or salads (stems attached to blossoms are often discarded due to toughness). Oregano–member of the mint family and is similar to marjoram, but not as sweet and more pungent, spicy flavor and aroma; good in soups and tomato-based dishes. Thyme– tiny green leaves used in meat and vegetable dishes and most casseroles, soups, stews, and medicinal teas, which soothe sore throats. KALE: You will receive Green Curly (well-ruffled, curly green leaves on green stems; this variety makes a good, roasted “kale chip”). BABY LETTUCE MIX (Wildfire): a beautiful bag of dark reds and vibrant greens including Green and Red Oakleaf, Green and Red Romaine, and Redleaf lettuces. Your lettuce has been rinsed once, but needs washing. How to store: refrigerate in plastic bag for 3-5 days. HEAD LETTUCE: You may choose from Green Leaf, Red Leaf or Romaine. This will be an option on the side. -How to use: the bulb, flowers, and green leaves are edible; can be cooked, grilled, roasted whole as a vegetable; chopped in salads, soups, & other dishes for flavor. -How to store: refrigerate in damp towel/plastic bag for 5-7 days. SAUERKRAUT: This week The Brinery (www.thebrinery.com) is offering yet another rutabaga sauerkraut creation called “Tantre’s Ramroot” (cabbage and rutabaga). Rutabaga is the common American and Canadian term for the plant. It comes from the old Swedish word “Rotabagge”, meaning simply “ram root”. (That’s why they named it that!) The Brinery is a local foods business, specializing in naturally fermented, local vegetables and operated by former Tantré farmer, David Klingenberger. Keep in mind these krauts are raw and alive, so they need to be refrigerated. – How to use: use as a condiment with any dish, especially meat dishes, salads, roasted veggies, or sandwiches. – How to store: refrigerate up to 3 months or longer depending on how you like the flavor, since it will get stronger with more age. SPINACH: You will receive this large, crisp, dark green leaf, which is very large right now due to the weather and maturation. Some may prefer to cook this or juice it, if it’s too much for a salad. This will be the large leaves bunched in a bag with Arugula and Yukina Savoy bunches. – How to use: toss in fresh salad, add to sandwiches, sauté, steam, braise, or add to crepes, quiche, lasagna, and soups. – How to store: refrigerate with a damp towel/bag for up to 1 week. WHITE HAKUREI TURNIPS and GREENS: A white salad turnip with round, smooth roots that have a sweet, fruity flavor with a crisp, tender texture. Use the greens as well, sautéed or braised. – How to store: remove greens from turnip root and store separately in plastic bag in refrigerator for up to 3 days; roots can last up to 1-2 weeks in refrigerator. YUKINA SAVOY (Asian Green): similar to Tatsoi, but larger round, thick, savoyed, dark green leaves held upright on pale green petioles. These will be the rounder dark green leaves bunched in a bag with Arugula and Spinach bunches. How to store: refrigerate in plastic bag or wrap in a damp towel for up to a week. 1. PLEASE LET US KNOW of any changes in your address, phone, e-mail, or of misspelled names on any mailings or check off lists at Distribution Sites as soon as possible. 2. CHANGING PICK UP DAYS: Please remember to contact us preferably a week in advance, but at least by Sunday of each week, to make changes in pick up days or locations. It is very disappointing to put together a box that is never picked up. Please have the courtesy to make some kind of contact with us, if you can not pick up your box for some reason. 3. PAYMENTS DUE: If you still owe money, it will be reflected on the check-in sheet, when you pick up your box. If you believe there has been some mistake, or have any questions, please call or e-mail us. 4. CSA COOKBOOK: We will have a handy cookbook for sale this season called “From Asparagus to Zucchini: A Guide to Cooking Farm-Fresh Seasonal Produce”. This $15 book includes an easy-to-follow format with vegetables listed from A to Z. Here are the owners of Tantre Farm, Richard Andres & Deb Lentz, and their daughter, Ariana. Richard and Deb both grew up with a connection to farming and growing food. Richard grew up in Plymouth & Canton, Michigan. He had an early interest in farming, since he worked as a teenager picking corn for a local farmer. Then he started raising and selling strawberries, corn, and muskmelons on his parents’ property. He also worked at his friend’s farm, Garden Works, for a few years. Following that, he tended traditional, Asian-raised gardens at the Ann Arbor and Toronto Zen Buddhist Temples for a number of years. 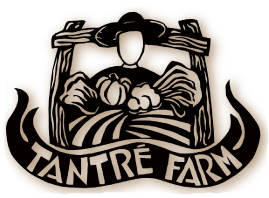 Finally, he bought Tantré Farm in 1993, and proceeded to make it certified organic. After that he began growing organic potatoes, winter squash, and garlic for wholesale orders, besides continuing full-time work as a timber-frame carpenter. Deb grew up on a 160-acre beef farm in Lake City, Minnesota. She graduated from the College of St. Benedict in St. Joseph, Minnesota with an Elementary Education degree. She taught fourth through sixth grades in Central Minnesota and worked as a counselor at a Summer German Camp for the next 10 years. Then she met Richard in 1994, which led to their marriage in July of 1997. After that she taught first and third grade for several years in Napoleon, Michigan, until their daughter, Ariana, was born in 2001. Richard is working as a full-time farmer now, and continues using his carpentry skills through the many maintenance and building projects of the farm. Now Deb publishes the newsletter and coordinates the communication and bookkeeping of the CSA. She also continues to enjoy teaching to groups who come to the farm for field trips, as well as, in area schools through Farm-to-School programs. Ariana is now completing fifth grade, and she is looking forward to playing with lots of kids on the farm this summer! Both Richard and Deb enjoy the sense of community that running Tantré Farm creates for themselves and their daughter, as well as the many young interns/farmers who live and work on the farm, which provides the opportunity to serve the local community fresh, organic food. 1 1/2 cups coarsely chopped garlic scapes or greens, lightly packed. Combine the garlic scapes or greens, cheese, oil, and nuts in the bowl of a food processor and process until fairly smooth. Add water as needed to make a spreadable paste. Add salt and pepper to taste. Yields about 1 cup. SAUTÉED HAKUREI TURNIPS & BRAISED GREENS Serves 6-8. Cut the greens from the turnips. Wash and tear all the greens into large pieces and remove the stems. Cut the turnips into bite sized pieces. Heat 1 teaspoon of oil in a sauté pan over medium-high heat. Sauté the turnips and onion stirring or tossing occasionally until they are crispy outside and tender inside. Season with salt and pepper and remove to a warm plate. In the same pan, heat the remaining oil over medium heat. Add the washed and wet greens, and add to pan in batches. Stir and mix as they wilt. Add the wine or other liquid and cook until it is mostly evaporated. Lay the greens on a plate and arrange the warm turnips on top.